Over at j-aircraft.com Jim Lansdale has posted the image of an extant artifact from Hayabusa S/N 422. This was an aircraft from the 3rd Chutai of the 50th Sentai, possibly flown by Sgt Maj Tomematsu Hama and brought down near Chittagong on 10th December 1942 by a Hurricane flown by F/Sgt W 'Bill' Hinton of 135 Sqn RAF. I have posted an extract from the EAI report describing the remains of this aircraft at j-aircraft.com. This artifact, a piece of fabric from one of the flying surfaces, is painted in dark green over aluminium. The dark green has been visually matched to Munsell 10 GY 2.5/2.0. The closest FS equivalent is 14077 @ 1.25 (2.0 or less = a close match). 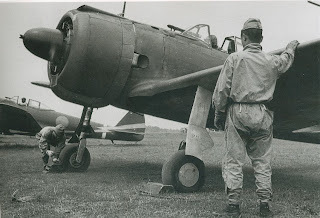 The colour is similar to JAAF paint standard # 27 'Ao Midori Iro' and provides a useful clue about the appearance of the dark green paint on these early Type 1 fighters. The close relationship between these colours may be seen from the large gradient chip at centre. 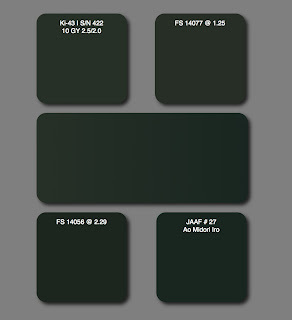 This deep green colour is often referred to as "Nakajima Green" and is available as a ready-mixed colour in several hobby paint ranges. The 50th converted to brand new Type 1 fighters at Tokorozawa in Japan from April 1942, before returning to Burma in September of that year. The heading photograph shows a sister Hayabusa of the 50th, S/N 438, being run up at Tokorozawa. With grateful thanks to Ken Glass for his kind assistance in calculating the sRGB values for the fractional Munsell notations and to David Duxbury for making the EAI reports available.